NYMEX WTI stays above $60 barrel, supporting the Scandinavian currencies. The New Zealand dollar plunged 1.5% after the RBNZ made an ultra-dovish hold earlier today. NZD/USD is now trading near twelve-day low. The central bank maintains its Official Cash Rate at 1.75% but sent a clear and strong signal that the next step could be a rate cut amidst weaker global economic outlook. The move is acting as a drag on the Aussie as well which is trading lower 0.6% as an investors surmise the Aussie government could adopt a similar stance over the short term. The greenback, as tracked by the DXY, is trading without a clear direction this morning. Fear of a global slowdown and falling yield curves have resurfaced and hanging as dark cloud cover over financial markets. Equity markets are mixed as investors adopt a cautious approach. US housing starts plunged nearly 10% in February when compared to the previous month. Consumer confidence also took a dent amidst growing volatility. Trade data released this morning revealed deficit is narrowing down $8.8 billion to 51.1 billion: There were fewer imports from China as businesses prefer to delay and wait on developments around Sino-US trade talks. The Brexit saga is turning into a classic example of how politics can create havoc for the economy and add more uncertainty for the people. GBP/USD continues to trade inside recent ranges. The MPs gather again for indicative votes in the Parliament which in the end are non-binding and which the PM is expected to reject. At this stage, we are looking towards a longer extension, adding more uncertainty to the pound. EUR/USD is drifting lower towards the mid-point of 1.12 after ECB Chief Draghi reiterated concerns of moderation to recent growth. The Eurozone is losing momentum as indicated by recent incoming data, and the ECB is expected to add more to the current stimulus package. The economic calendar remains light, and the pair is hanging on critical technical support. A break below could send the shared currency to levels last seen in November 2016. The Canadian dollar remains in a consolidation phase, oscillating around the 1.34 handle for the fourth session in a row. Trade data pointed to a 2.9% increase in exports on higher crude oil prices and helped narrowed down the deficit in January. We expect higher oil prices to continue to lend temporary support to the loonie. 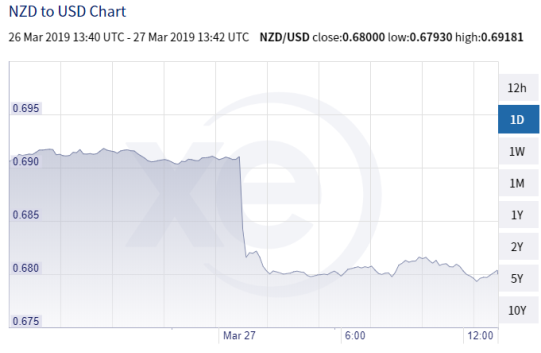 The Australian dollar is on a downward slide on the influence of New Zealand's dovish interest rate hold. After touching a high of 0.71426 it now sits at 0.70818. The US dollar’s progress has stalled and is now moving in a reverse direction, fetching 110.50 yen. The risk-off sentiment is back with the US Treasury yield trading at its lowest level in fifteen months. Safe-haven flows are expected to keep a lid on further upside move for the USD/JPY.